The Evil DM: This is how I roll! : TMNT! Its Turtle time! A little show, about these cartoon turtles who mutated into human like sized ninja fighting machines debuted on CBS, it was called Teenage Mutant Ninja Turtles. It started as a 5 part mini-series in 1987, then exploded into a regular Saturday morning cartoon, and finally was on 5 days a week with new episodes. The cartoon went for 10 seasons, lasting until around 1996 causing a crazy in the USA, with shirts, lunch boxes, more comic books, and then finally a bunch of live action movies. 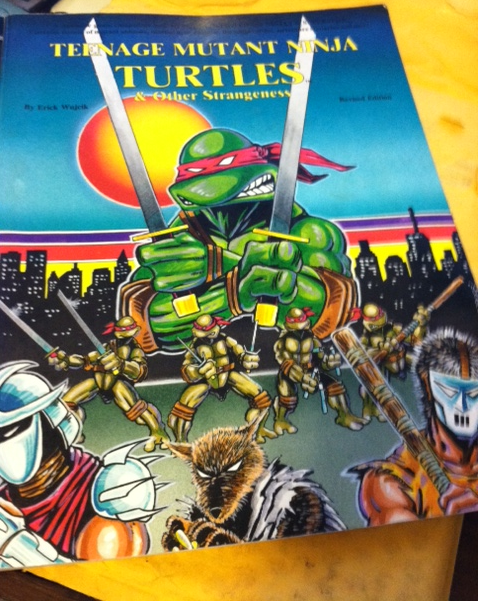 Now comes to the RPG, which was out BEFORE the "turtle crazy". The TMNT rpg, was written and sold in 1985 by Palladium Books, while the comic books were being produced here in the USA. I remember this game fondly as a boy, picking it up at the local gaming store, and thinking, "wow, this looks cool". Spending hours of fun in the summer of '86, at my friends house everyday, playing the hell out of this game. It was so cool, I remember saying, "you could play D&D, but as animals, and you could be NINJAS!" The system was a bit wonky, but we figured it out, as I played through my Dog like character named "Chuff", beating up on various baddies my friends made up. Then we stopped. Time passed as we forgot about the game. Then, there was the cartoon. I remember going to school that Monday, and finding my friends with a young boy excitement in my eyes, because of this new cartoon that I saw Saturday. In fact we all saw the cartoon, and decided to put our D&D on hold, to play this again. We played as the cartoon fueled tons of adventures as now we had "The Shredder" to fight against. Our adventures always involved our little group, helping out the turtles, who often got kidnapped or went missing. Ahh.. the good old days..
Well, its back, as today, it arrived in my mailbox, for only the price of $3.00USD and condition was excellent. I am very happy about it, you should find this book and give it a whirl! Awesome! I picked up a copy last year while on vacation. As kids we didn't play the main TMNT game but we did play the Mutants Down Under supplement (pre-cartoon) on account of being Aussies.